A new trailer for The House with a Clock in Its Walls has arrived online. The first teaser for the adaptation of the classic kid's book debuted in March providing us with our first look at Eli Roth's take on the material. This trailer gives us a much more in-depth and thorough look at the family-friendly horror adventure that is coming our way this fall. Amazingly, it looks like the man known for being a modern, R-rated gore master managed to craft a delightful, PG adventure movie with some reasonably gentle but effective scares. This is increasingly becoming a 2019 movie that might sneak up on a lot of people. 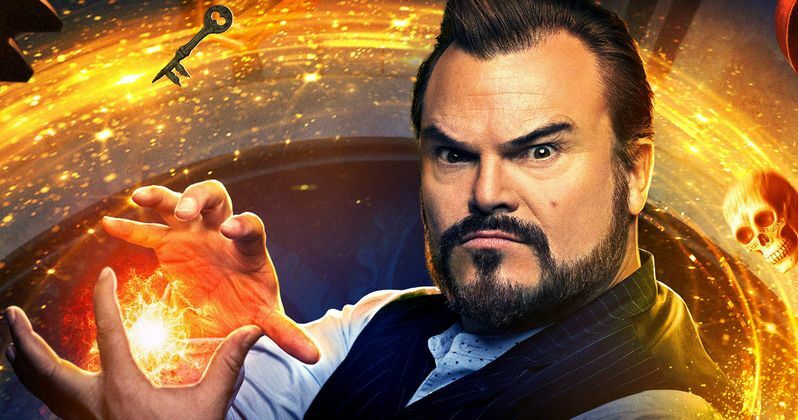 This particular trailer highlights the dynamic between Jack Black, who plays the kooky uncle, one that happens to be a warlock, and his nephew Lewis, played by the young Owen Vaccaro who winds up becoming his pupil. This look at the movie also showcases a ton of the CGI and various special effects work going on. In some ways, this looks like the movie that perhaps the first Goosebumps wanted to be but didn't quite manage to be. Having Cate Blanchett on board certainly doesn't hurt matters. This definitely looks like a lot of fun and something way outside of what anyone ever expected from a guy like Eli Roth. The House with a Clock in Its Walls hails from Amblin Entertainment and it very much has the vibe of a classic Amblin movie. The magical adventure centers on 10-year-old Lewis who goes to live with his uncle in a creaky old house with a mysterious tick-tocking heart. But his new town's sleepy façade is brought to life with a secret world of warlocks and witches when Lewis accidentally awakens the dead. Accidents are bound to happen when you start teaching your young nephew the ways of magic. The movie is based on the beloved children's classic by John Bellairs and illustrated by Edward Gorey. The movie is written by Eric Kripke, the man responsible for creating Supernatural. The cast also includes Kyle MacLachlan, Colleen Camp, Renée Elise Goldsberry, Vanessa Anne Williams, Lorenza Izzo and Sunny Suljic. Eli Roth is responsible for movies such as Cabin Fever, Hostel and The Green Inferno and is an unlikely choice for a project such as this. For contrast, he also helmed the Death Wish remake earlier this year. However, great things can happen when someone steps outside of their comfort zone and, so far, it looks like Roth might have absolutely nailed this. The House with a Clock in its Walls is set to arrive in theaters on September 21. It's the only wide release hitting theaters that weekend, but the following week sees the release of the family-friendly animated movie Smallfoot, which could provide some competition. Be sure to check out the brand new trailer, courtesy of the Universal Pictures YouTube channel, for yourself below.